In order to accomplish the task of properly resettling those who are being relocated from our village, and to ensure the total success of the clearance from the dam area, a number of county, town and village cadres have repeatedly been to Lu Chengming’s home in Xingsheng Cun (Abundant Village) to persuade him to see reason, but comrade Lu Chengming still refuses to be resettled. Chongqing City hereby invokes the law pertaining to the regulations of Article 62, Section 2 of the “Ordinances for Relocation in the Construction of the Yangtze River Three Gorges Project,” and has decided to take coercive measures to evict the two people in this household. This was the first example of forcible evictions from the area to be submerged by the rising reservoir of the Three Gorges dam—and it marked the end of the government’s use of proper procedures to move people away. 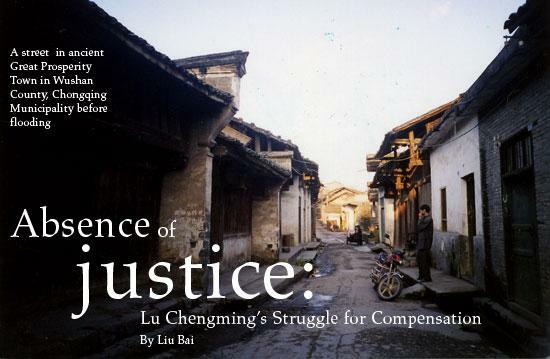 It is my opinion, after conducting interviews in Wushan, that erroneous and corrupt property assessments were ubiquitous, no household was compensated promptly for being resettled, and no household suffered greater losses than Lu Chengming’s family. As far as the people to be relocated were concerned, eviction simply meant the beginning of their lives as refugees. Great Prosperity Town was a small, ancient town. It had old trees, an old wall, old streets, and a history reaching back 1700 years. The Dongfang Fandian (Orient Hotel), situated on the bank of the Daning River (Great Peace River) in the southeast of the old town, right next to the Star Anise Hill Wharf, was the tallest building in town. People getting on and off boats everyday at the wharf had to go past the dining hall of the hotel. Lu Chengming, the owner of the hotel and the wharf, could often be seen standing in front of the hotel entrance, deferentially welcoming people and seeing them off. When the CWRC’s first survey was done in 1991, Lu Chengming’s family was recorded as consisting of five people—a husband and wife and three unmarried children. In 2002, before the dam project’s second stage relocations happened, the family had expanded to 11 people—a husband and wife, and three young couples with one child each—all still living together. They all worked as a family to run the Orient Hotel. But on September 20, 2002 the hotel was knocked down and the notice of forcible business deregistration arrived on November 18th. That was how Lu Chengmings’ entire family ended up becoming unemployed. At the time of the forcible relocations, the authorities split the family into four households in order to reduce the subsidies they were entitled to. Lu Chengming and his two sons were each registered as the head of a household, and each of these families was to be helped to re-settle under the procedure of “self-employment”; the daughter moved to far away Guangdong province, but she later returned because she couldn’t get used to life there. Lu Chengming began to make appeals to higher authorities about his situation in 1993, and he has continued to do so for the last 14 years. He and his wife only began to get the most basic welfare assistance of 100 yuan a month from the town in March 2006. In 2007, after having been resettled 12 times in the intervening years, the family was temporarily lodged in the new part of town at 166 Dragon Well Street. Their home was a 100 square metre apartment in a building constructed especially to house relocated people. My name is Lu Chengming. I’m of Han ethnic background, and I was born on May 29, 1950 in Da Xingcheng (Great Abundance Village). As far as my educational background goes, I only finished third grade, so I’m semi-literate. My parents passed away one after the other in 1959 and I was really brought up by the village production team. I was a soldier in section 0187 of the 54th Army from 1968 to 1970, ending up as the deputy squadron leader but I was demobilized in 1970 because I became partially disabled. This is my disability card: Number 800884. I only became a member of the Party after leaving the army in 1970. After that, I was commander of the People’s Militia, director of Public Security of the village, deputy secretary and also secretary of the village branch of the Party. When the economic reforms started in 1978, I wanted to see more of the outside world, so I went to work as a labourer in Hubei Province for eight years, saving money little by little. Then after returning in 1986, I built the Orient Hotel in Great Prosperity Town, and later constructed a wharf. I was often considered a progressive entrepreneur in Wushan County because of the enterprising way I operated and managed the business. I was also consecutively elected as director of the Self-Employed Workers Association of Wushan and the chief cadre of Great Prosperity Town’s entrepreneurs from 1989 to 2002. In those days I thought that the reforms and opening up2 were really beneficial and that the Three Gorges Project would help create even more opportunities for the people. Besides which, my business was doing a roaring trade; we had 30 beds, a dining room large enough for ten tables, and we also sold all sorts of other goods along with rare stones from the Three Gorges area and cultural artifacts of the Ba minority group in a little exhibition hall. I was sure that after the Three Gorges Project was completed, that business would get even better. In 1991, the Changjiang Water Resources Commission did its first survey. Then, at the end of 1992, a committee made up of kids who had barely graduated from high school came to my house to do a second survey. They didn’t measure the area of the house or look at the certificates of land use or house ownership but just took very rough measurements to get the job done as fast as possible. I told them that 80 square metres of the building had been built in 1994, but that the rest was built before 1992 and was therefore qualified for compensation. They didn’t take a blind bit of notice. I got really agitated and began arguing with them when I saw that they wrote the figures for only the ground floor, which was 250 square meters, in their book. I asked them to remeasure the house but they just sauntered off. As if that wasn’t enough, they reckoned there were three wharves in Great Prosperity Town, one of which—the Star Anise Hill Wharf3—belonged to me. But under their heading “Owner of the Wharf” they simply didn’t bother writing that the Star Anise Hill Wharf was all paid for, built and operated by me. It really made me furious. So, I went to see the authorities in Wushan and Chongqing but they said that though the house may have been over 600 square metres in size, I had no proof that it had been built before April 4, 1992. Heavens! But when they did the survey, I had the land use and home ownership certificates; they just didn’t look at them. So how could the authorities turn around and say there was no evidence to prove that the house was built before April 4, 1992? Besides, even if they hadn’t looked at the certificates then, there was still time to look at them and remeasure the house, but they didn’t bother doing anything. Wouldn’t you call that a clear case of taking advantage of someone? And then there was Star Anise Hill Wharf, which also belonged to me. In 1987, Great Prosperity Town had three boat docks, but as far as wharves go, only the Star Anise Hill and Xiaonanmen (Little South Gate) wharves were deserving of the name. That year I’d opened the hotel and had a few savings. I could see that the slope down to the wharf was so steep that it made getting onto and off of it very difficult in wet weather, so I decided to build a decent wharf for my fellow townsfolk, after discussing it with my wife. She urged me to wait a while, as after so many years of financial struggle, we were only just in the position of being able to loosen the reins a little. But in September the following year, an old lady from Guanyang (district) got into a panic as she was going down the steep slope to the boat and she tumbled into the river. As luck would have it, I was there at the time and was able to rescue her by jumping into the water and pulling her out. Then we helped her up to our house and gave her some clothes to change into. That evening I brought up the subject of building the wharf again with my wife and this time she agreed. So during the winter that year when it was dry and the water level was low, I invested 20,000 yuan (US$2,500) in the project. We worked night and day to build 57 concrete steps out of mixed stone and cement and also installed some anchorage points on the new wharf. The cost of building all of this and the 2000 yuan (US$250) it takes to maintain it annually have amounted to around 50,000 yuan (US$6,250) over the years. Although some people said that we were adding to our worries by building the wharf, to be frank, it wasn’t an issue. But what happened afterward has been so hurtful that now I’m always miserable and can’t sleep at night. Here also is a report from the Sanxia Dushi Bao (Three Gorges Municipal News) of September 2, 1999, “Ten thousand yuan donated to build the wharf and he’s never charged a cent.” It reads: “there is a concrete platform for people to get on and off boats, concrete steps and male and female toilets … and for the past 11 years not a cent has been charged.” In what way could anyone be unclear about the ownership and construction date of the wharf? However, when it was time to pay compensation, those responsible in the town and county government departments seemed all at once to have something wrong with them. One day they’d all say that the wharf was just a temporary berthing spot, the next that I was trying to reap a huge profit from it, then that I was a just a nuisance trying to provoke trouble—when I heard this, tears started flowing—even though they kept embarking and disembarking at Star Anise Hill Wharf as always, and even though I had presented submission after submission entreating them to verify the ownership of the wharf through “Examination of the Documents.” 5 No matter how much I urged them again and again, they took no notice. The townsfolk wrote many testimonials for me, but the officials said that all of the people who had done so were connected to me in some way and what they had written wasn’t admissible as evidence. So, Star Anise Hill Wharf was built and demolished all for nothing. How can it be right that under the Communist Party you have to suffer misfortune and slander when you’ve done a good deed? Following the strict letter of the law in regard to estimating demolition compensation, the Three Gorges authorities would have to pay me 100,000 yuan (US$12,500). But as I’m a Party member and made allowances for the government, I said that it would be enough if they gave me the original capital cost of 20,000 yuan (US$2,500). But now, I not only get nothing but I’m slandered in the bargain, so why shouldn’t I file a complaint about it? You might ask if any good will come of lodging a complaint. Well, I’ll explain. A memo came from the County Government Party Committee on August 27, 2001, stating that, “The Navigational Affairs Office of Wushan County’s Bureau of Transport and Communications would handle the matter of Lu Chengming’s wharf.” I was in Great Prosperity Town when I got this news and was delighted, as I imagined that there was some hope. So I quickly jumped onto a boat which took half the day, in order to go to the very imposing county government building in Wushan where I knocked at the director’s door in the Navigational Affairs Office, trembling at the knees. I never expected that the conversation would become so explosive right from the start. “Who has confirmed that the wharf is yours? What are the exact day, month and year of the county document that states that you, Lu Chengming, have a wharf? It’s obvious that what you have is just a temporary dock. If you want to discuss wharves with me, you might as well save your breath.” spat Director Liang. “You say it’s just a temporary dock, but in the survey report done by the head of the committee, it says there are three wharves—well, which three are they? And which of them is bigger or has better facilities than mine? Just a moment ago, according to you, my wharf was a temporary dock, but now you want to demolish it, so isn’t there some compensation that should be paid in accordance with the regulations for relocation?” I replied. Liu Xuepei, the head of Wushan’s Civil Culture Office who was right there while he was punching me, grabbed me tightly by the waist, thus enabling Director Liang to hit me better. The blood poured from my head down my face. Tan Guanyin asked about the circumstances then immediately wrote a note for me, saying I should go to the legal medical expert to get myself examined. I took the note to the legal medical clinic. In the appraisal they wrote that I had a purple swelling on my upper right eyelid of 3 cm by 3 cm, one in front of my left ear of 2 cm by 2 cm and another of 3 cm by 3 cm on my left temple. The conclusion was that they were minor injuries. According to the law, the assailant (Director Liang) should have faced 15 days of criminal detention or three months of short periods of detention for inflicting minor injuries. When he read the conclusion of the physical examination that I had undergone at the request of the Office of the County Party Committee, Director Liang stood in front of me pretending to be sorry and asked for forgiveness. I know that one can’t afford to get on the wrong side of officials so I agreed to accept his apology. We arrived together at the number two police station in Wuxia Town for the so-called “reconciliation.” I spoke first about how I had undergone the beating by Director Liang and he listened without a word, as if he agreed with what I said. His friends who were there all made conciliatory comments, and I was compensated 800 yuan for medical expenses. The “reconciliation” seemed to go very smoothly. I took the “reconciliation” document back with me, but only when I got back to Great Prosperity Town did I find out that it contained the following information: that I had insulted and abused Liang in order to resolve the situation of the wharf and had ended up getting in a fight with him where both of us had grabbed and hit each other. I had to accept a fifth of the blame for this and pay Liang 200 yuan—they had taken advantage of my illiteracy to write sheer nonsense! Is there anywhere that the ordinary people can get justice? What they had said to me at the police station was wrong and without substance. As a Party member, had anyone ever seen me abusing anyone in the streets of Great Prosperity Town, much less in a government office? They had turned the truth upside down, but all the power was in their hands and the ordinary man in the street just didn’t have a chance! You have a look for yourself, according to the regulations of the CWRC, “Any building with legal certification constructed before April 4, 1992 can receive compensation.” In addition there is also the CWRC’s survey, “Questionnaire Regarding the Submersion of Wharves in the Three Gorges Dam Project” of December 21, 1991. Have a look at what it says in writing about Great Prosperity’s three wharves, which the CWRC describes as “fixed,” “mixed stone,” and “passengers and goods.” It also says that Star Anise Hill Wharf had several anchorage points, “the highest anchorage capacity being 200 tons,” and the original value of the unmovable fixed assets was acknowledged to be 80,000 yuan (US$10,000). Wushan County’s Resettlement Bureau and Transport and Communications Bureau both have a copy of that survey questionnaire. According to the regulations of Article 4, Section 22 of the “Ordinances for the Compensation of Relocated Migrants in the Construction of Large and Middle-sized Hydraulic and Electric Engineering Projects,” compensation should be paid according to the original size, standard or capacity of the fixed buildings on the reclaimed land. Is there no justice under the Party? I continually made written reports and phoned relevant government departments and leaders all over the country: the Chongqing Resettlement Bureau, the Municipal Government, the Three Gorges Construction Project Committee, the State Council, and the National People’s Congress. They all said I was in the right, and said I should wait for the case to be dealt with. So I did wait, but I never thought they would deal me such an underhanded blow! I was totally unprepared for what happened next. It was September 20, 2002. At dawn, the wrecking team came with their bulldozers. Workmen, cadres, security police, altogether more than 200 people were present, including the local chief of Armed Forces, Ma Zhenglun, who was also in charge of the demolition organization. All the while the town’s mayor, Wang Zuqian, ran the operation by remote control from inside the government building compound. First a huge crowd, roused to action, moved everything out of the hotel, the shop and the house. Then the bulldozers were brought in, and in a little over half an hour they totally flattened my home and hotel. When the job of bulldozing was finished, all that was left of my household possessions was piled up in the open air. Ma Zhenglun asked what he should do about them. Ordinary people who had come to have a look were standing around him. Wang Zuqian called him on the mobile phone from his position in the government compound and angrily ordered him, “Take everything 175 metres up the hill and away from here and set fire to it all!” At the time I was still waiting for the next level of government to proceed with checking and confirming the status of my wharf and house, but if they acted like this, it was tantamount to killing one person to warn the rest, to show that they could just lord it over everyone. My wife and I were evicted by force from our business. They reckoned that after what happened to us, others in the same position would be docile and willing to do what they were told, but they were far too simplistic in their thinking. I support the necessary demolition and relocations so that our country can build the dam, but it has to be done equitably and lawfully. Of course I want to fight to obtain the compensation I am entitled to! I’ll definitely fight for justice under the law! The newly arrived secretary of Great Prosperity Town, Tang Xingjian got me to leave the warehouse and move into temporary accommodation in the new part of town in 2004, just to encourage new business enterprises. But then just before the Spring Festival in 2006, the latest secretary of the town, Huang Zonglin moved us out of that apartment to a different area—this time a 91.75 square metre apartment on the sixth floor of a building. How could the 11 of us manage to live there? Between September 2002 and now we have moved 12 times altogether. We’ve suffered the loss of many of our possessions because of all the moving from one place to another; the electrical appliances we used in the hotel and also the beds, bedding and especially our rare stones have been lost or badly damaged. Two of our precious stones, “Yi kong chi chi gui” and “Xian ren ting,” that once received prizes in the “China and International Stone Appreciation Exhibition” have been knocked and bumped about so much that they have lost their value. Great Prosperity Town is now just an expanse of water. Despite the fact that the water level has gone up so much, the wharf at Star Anise Hill is still there. Now it is a coal storage area, there are no visitors or people using it. I just don’t want to talk about how bitter I feel every time I go past it. Lu Chengming has been back and forth from Great Prosperity Town to Wushan over a hundred times since September 2002, in an effort to get properly reimbursed so he could begin life again. But each time was a torment to him. Those in authority always had their “reasons” for rejecting his claims. When I saw him again in April of 2007, five different town mayors and secretaries had been in office in the intervening years and his case was still unresolved. In 2006, two very decent and upstanding counselors from the Chongqing Municipal Government, Lei Hengshun and Zhao Zelong found out about the circumstances of Lu Chengming’s situation, accepted his submissions and promised to find a way to make representations to the higher authorities on his behalf. The Chinese economic reform (or socialist market economy) opened China to the global market in the late 1970s. The reforms were introduced by Deng Xiaoping who served as the general secretary of the Communist Party and later as Chairman of the Central Military Commission. The survey by the Changjiang Water Resources Commission even assessed the Star Anise Hill Wharf at 25 meters long, 15 meters wide, with 57 concrete steps leading to the top of a steep embankment. It seems that a rudimentary version of the Star Anise Hill Wharf existed when Lu Chengming built the hotel and wharf, but that he subsequently constructed proper steps to it and reinforced it to make it the largest, safest and most serviceable wharf in Great Prosperity Town. “Examination of the Documents” is a legal procedure used in China to confirm somebody’s identity. Lu Chengming uses it ironically here to entreat the officials to “examine the documents” in order to verify his legitimate ownership and investment in the wharf.